Just in time for Shakespeare’s 450th birthday, booksellers George Koppelman and Daniel Wechsler have begun publicizing an annotated copy of John Baret’s An alvearie or quadruple dictionarie (1580) that they believe to have been the poet and playwright’s own. 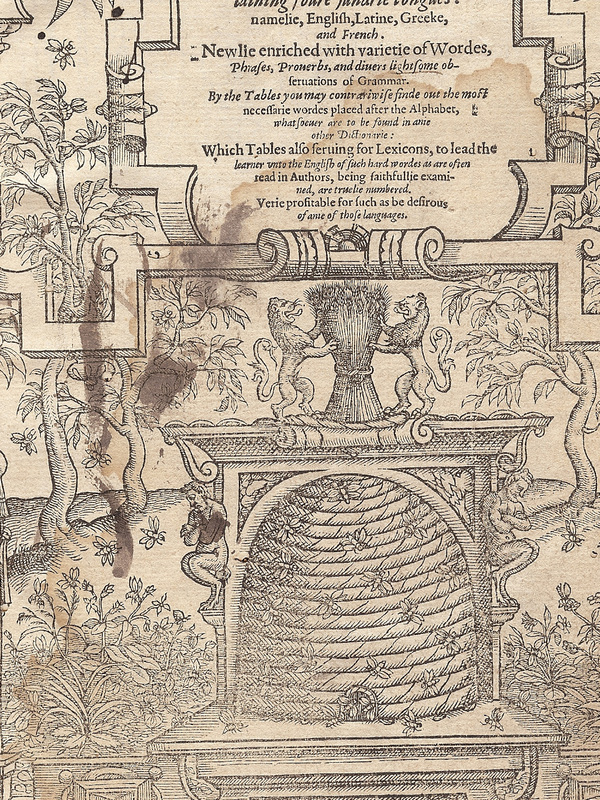 As part of this effort, they have launched a rather impressive website, Shakespeare’s Beehive, and have published a lengthy book making their case. Several news outlets have reported on their copy of Baret with some excitement—a book owned by Shakespeare should indeed provoke excitement—and the best piece to date is Adam Gopnik’s measured essay for the New Yorker: “The Poet’s Hand.” It explores both the particular story of this volume as well as, more generally, the unrelenting desire we have to know and have material contact with the man that was William Shakespeare. In my seventh- or eighth-grade science class, a patient Mr. Morris spent a full period explaining the concept of “significant figures” to us—”sig figs,” he liked to call them. He did so just as we were beginning to work with chemicals, mixing and measuring them. What I gained most from his lecture, and what has helped to keep my thinking in check well beyond novice experiments with chemistry (ones that burned my fumbling hands), was the reminder that conclusions based on observations can only be as precise as the least precise of them. I seem to remember that our graduated cylinders could only measure volume to the nearest milliliter, meaning that my lab group would have misrepresented the quality of our data if we tried to move past that small yet bold decimal point. There was quite simply no honest way for us to get to a result of 96.7ml—or anything like it—even if our calculators returned it. Now, of course, applying the concept of significant figures to the situation of the Baret volume is something that can only be done very loosely. Nevertheless, there was at least one lesson I took away from Mr. Morris that’s relevant here: no matter how much you have, you can’t erect precision (let alone accuracy) out of material that lacks it. In Gopnik’s report, Wechsler explains that “it isn’t any one” piece of evidence that makes the case for Shakespeare’s ownership of An alvearie, “it’s the totality of them.” The challenge, though, is that each piece of evidence has to be independently compelling if adding up all of them is to get us very far. As Michael Witmore and Heather Wolfe indicate in their post on The Collation, it is important that the booksellers be able to show that their annotator was interested in language that can be identified with Shakespeare in particular. They ask, “How many of the words underlined or added in the margins of this copy of the Alvearie are used by Shakespeare and Shakespeare alone, as opposed to other early modern writers?” At least one answer the sellers hope to give appears in a set of annotations present on a blank leaf at the end of the book. The leaf, which, based on wormhole evidence, was almost certainly with the text in an early binding, is covered what are in all likelihood the notes of a seventeenth-century reader. (In a series of posts on Twitter, Grace Ioppolo has weighed in on the date of handwriting in the volume and the likelihood of it being Shakespeare’s.) In their study they call it the “trailing blank,” and see various bits of the “word salad” inscribed on it as clinchers for their attribution. I’ll go ahead and cut to the chase: what the booksellers read as a hyphen is a smudged “t” in the annotator’s 17th-century hand, a “t” that completes the word “Bucket,” which, as just hinted at, is English for the word “bacquet” that follows it. Compare it with the “t” in “bacquet” itself; they’re very similar in shape. The horizontal line at the end of “Bucket” may be comparatively thick, but the fact that there’s a vertical attached to it eliminates the possibility that the word is merely “Bucke” and points toward the more obvious conclusion that the writer allowed a bit too much ink to flow. Notice, too, that the there remains a large space between the crossbar and the “b” of “bacquet.” What we have, then, is what we might expect a reader to record in their multilingual dictionary: the word in one language followed by the word in another. And this is the same format that we see in the left-justified annotations on the same page (in a darker ink). Gopnik states their “buck-basket” claim matter-of-factly, but Koppelman and Wechsler (at least in the draft I’ve seen) back off from their reading at the same time that they offer it up in the first place: “‘Bucke’ looks to have a hyphen mark at the end of the annotation” (my emphasis). For all their hesitation, though, they seem to have no problem taking “buck-basket” as a starting point for making a series of further connections between annotations on the page and Merry Wives. I’m tempted to make the obligatory reference to Matthew 7 here, but doing so would concede that the house built on the foundation of sand is in fact a house at all, and not just more sand. As I wrote on Twitter yesterday morning, if you approach almost any early printed book asking, “Was this Shakespeare’s?,” I’m confident you’ll find reasons to say that it was. This all said, a single botched example doesn’t mean that Shakespeare didn’t own the Koppelman and Wechsler volume—I haven’t worked through all of their claims—but I would suggest that the wishful thinking we can detect in it is indicative of what we see in the wider study. To get to “buck-basket” from “Bucket bacquet,” they had to have Shakespeare firmly in mind, using him as a lens for focusing (and bending) their data. When Gopnik was at Yale’s Beinecke Library examining the William Henry Ireland forgeries for his essay, David Kastan told him that the annotated Baret “was probably worth ten thousand bucks or something,” and I hope against hope that it will ultimately enter a research library at that price. It really is a fascinating copy of an important title, whether or not it was graced by the hands of any famous author. I suppose it is only fitting that it is to Shakespeare that we must give our final thanks: without his cult, the annotations would not likely have come to light. * The images are from Koppelman and Wechsler’s copy of John Baret, An alvearie or quadruple dictionarie (1580). Please see their website for the book, Shakespeare’s Beehive. I do hope that my use here will be considered fair.